Firm: Meehan, Boyle, Black & Bogdanow, P.C. Bradley M. Henry is a trial lawyer specializing in wrongful death, catastrophic personal injury and commercial property loss cases. In 2016, the US Supreme Court declined further review of a $63 million trial verdict (a judgment of $148.5M) that Henry won with his law partners, Leo Boyle and Michael Bogdanow, against a global pharmaceutical giant for devastating, life-long adverse drug reactions suffered by a child. See Reuters, http://www.reuters.com/article/us-usa-court-johnson-johnson-idUSKCN0UX1VW; Reckis v. Johnson & Johnson, 471 Mass. 272 (2015), cert. denied, 136 S. Ct. 896 (2016) (http://masscases.com/cases/sjc/471/471mass272.html; http://lawyersusaonline.com/reprints). Henry, now the firm's Managing Director, joined Meehan Boyle in 1989 and initially defended airlines, aircraft manufacturers and aviation interests in federal court, before transitioning to plaintiffs' work. 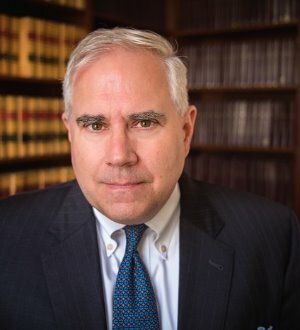 He was the primary handling attorney of the college alcohol hazing death case of Krueger v. MIT from 1997 to 2001 as well as the commuter rail cardiac death case of Allen v. MBTA from 2002 to 2005. From 2006 to 2009, he served as Plaintiffs’ Liaison Counsel in Boston's “Big Dig” tunnel ceiling collapse case of DelValle v. Bechtel, a products- and construction-related wrongful death case that ultimately settled with 15 defendants for $28.1 million. Henry’s practice has included plane crashes, mid-air collisions, complex product and weapons cases, refinery explosions, mass shooting tragedies, hazing deaths, building / bridge / tunnel and other construction collapses, MBTA, railroad and other transportation disasters, electrocutions and gas explosions as well as nursing home and pharmaceutical cases. Henry speaks regularly at seminars and conferences around the country on media, the law and handling high-profile cases.